People deal with tragedy in different ways using the tools they have at their disposal. Painters paint, writers write, and gamers mod. Lately, I’ve been interested in seeing how game modders and mappers have recreated the World Trade Center, the events of September 11, and the WTC Memorial in various game engines. Some of these are profane and offensive, quite likely made by teens that have no first-hand memory of the disaster, but most are intended as tributes. Here’s the best of what I was able to find. By far, the most impressive recreation of the World Trade Center is the ongoing WTC IV project. It adds accurate, photorealistic versions of the World Trade Center subway station and buildings to GTA’s Liberty City — including the plaza, tower lobbies, and car park, with elevators to the rooftop and Windows on the World restaurant. Download the mod, and keep up with ongoing updates, at the project homepage. The stark profiles of the twin towers fit well in Minecraft’s pixely world, and fans have attempted the towers many times. The most accurate model I’ve seen only works in Classic mode, as newer versions of the game limit the height to 128 blocks. This version of the WTC Memorial was released yesterday, recreating the memorial pools, museum, park and surrounding buildings. It can be downloaded here, from the YouTube video description. 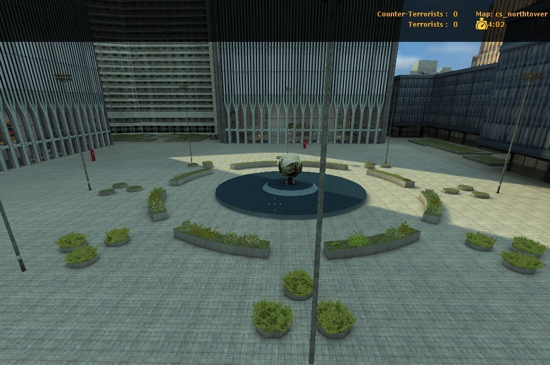 This impressive Counter-Strike map covers the building exteriors, plaza, and interior of 1 World Trade Center. This was the first deathmatch map created by Singe, who said, “I always wanted to visit the WTC but never got to, so this is the next best thing I could do.” It’s available for download, along with a snow-covered winter alternative. Announced yesterday, but not yet available for download. Looks a bit out of place, but the exteriors are impressive. Not very accurate, but about as good as you can get in the Sims engine. Unfortunately, not yet available for download. Let me know if you find any more WTC maps and I’ll add them to the list. No crass 9/11 recreations, please. The Spiderman 2 game from ~2005 had two squares marking the footprints, with spotlights pointing up. Well done. Here’s a LBP recreation I found, but I thought it was tacky. Same with this one from Halo Reach. The minicraft version looks so real… crazy!